A diminutive, yet often dynamic rover who was one of Fitzroy’s best players in the 1923 Grand Final against Essendon, Harold (Harry) Carter crossed to Carlton in 1924 and gave the battling Blues good service for five seasons. Born and raised in Bendigo, Harry never let his physical stature (he was just 165 cm, or five feet, five inches tall at his peak) inhibit his ability, or his ambition as a footballer. By his late teens he was a star rover for South Bendigo, and in 1920 he accepted an offer to join Fitzroy. At Brunswick Street, Harry played 38 games and kicked 34 goals. Although he was left out of the team that beat Collingwood for the flag in 1922, he won a place in the 1923 Grand Final side, and was valiant in defeat when Essendon triumphed over the Maroons by 19 points. In 1924, Carlton’s committee decided that our star forward Horrie Clover was being asked to shoulder too much of a burden as captain-coach. Somewhat sensationally, they appointed Fitzroy’s recently-retired Premiership captain Percy Parratt to take over the off-field coaching role, while Clover continued as captain. It is highly likely then, that it was Parratt who convinced Harry Carter to join him at Carlton. Although Percy stayed just one season at Princes Park, Carter quickly became a consistent, sometimes inspirational contributor for the Blues through a period of little real success. He was appointed vice captain to Horrie Clover in 1927, and his season tally of 33 majors won him Carlton’s top goal-kicker award. Carter did play as acting captain in Clover's absence. In September of that year, Harry played in his one and only finals match for the Blues, when a gutsy Carlton team lost by one straight kick to Richmond in front of a huge Semi Final crowd of 63,000 at the MCG. Sadly, that was Harry’s penultimate game. In Round 5, 1928, Carlton was beaten by cellar-dwellers North Melbourne in a boilover at Arden Street. It was Harry’s first senior game for the season. Afterwards, it seems that Harry may well have had a falling out with his new captain-coach Ray Brew, who was known to berate his players whenever they didn’t meet his expectations. Whatever the circumstances, Harry Carter’s VFL career of 101 games and 88 goals came to an end that day. At 28, he joined that long list of players who have called it quits with plenty of good football left in them. Carter passed away on the 10th September, 1973 aged 73. 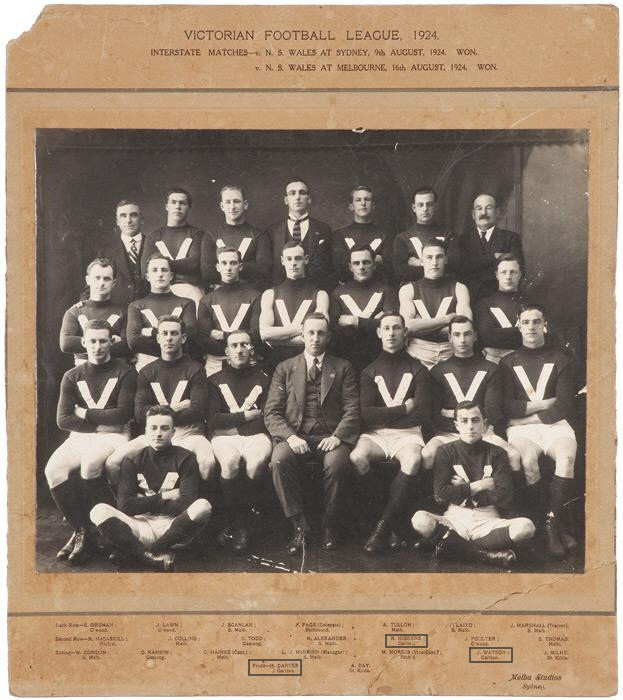 Harold Carter was selected in the 1924 Victorian team that played N.S.W. in Sydney August 09, and in Melbourne August 16. The Vics won both matches. Contributors to this page: blueycarlton , pblue , Bombasheldon , molsey , PatsFitztrick , tmd1 , true_blue24 , keogh , dgreen2 and admin . Page last modified on Wednesday 23 of November, 2016 08:07:19 AEDT by blueycarlton. 1984 - Ken Hunter profile (22/03/84).